Rushing into decisions that involve such sensitive issues might bring serious ramifications and unexpected unhealthy consequences. This is why, we further urge the school board not to individualize the issue, and jeopardize the position of any of the fine staff of the Dearborn Heights Public Schools. ADC's sole intention was to further inquire into the matter and make sure that your board is aware of the highly sensitive nature of the situation. The reference in the letter to "serious ramifications and unexpected unhealthy consequences" was not meant as a threat, but simply was an effort to alert the district of the wrong message that might come across to the community if this matter were to become more political, rather than educational in nature. Hamad then attempted to turn the tables on Panetta, reports today's Detroit News, by "asking municipal and school officials in Dearborn Heights to formally investigate Panetta's role in the entire affair. Both Hamad and [ADC] Deputy Director Rana Abbas say that at a school board meeting Tuesday night, attended by 150-200 people, officials distributed a copy of the first letter, but not the second." Dec. 22, 2003 update: On a different topic entirely, Hamad today again showed his colors and those of the American-Arab Anti Discrimination Committee while explaining to the Detroit Free Press why Arabs feel shame at the capture of Saddam Hussein: "You have to keep in mind that Saddam has been part of the region's history and political makeup for a long time. It's not easy for people to see someone who was so high up being treated this way." Imad Hamad, extremist and ADC dynamo, in a 2002 file picture. Dec. 28, 2003 update: Another "interesting" statement by Imad Hamad. Asked by the Detroit News for a reaction to a new policy at the Detroit airport, starting in just over a week, to photograph and fingerprint most foreigners as part of an effort to improve border security, Hamad called the step "a waste of resources. It inconveniences visitors and will result in fewer visitors coming to the United States." Here's a challenge to Hamad and the ADC: name for me a counterterrorist step that you don't consider a "waste of resources" and an "inconvenience." Feb. 3, 2004 update: The ADC's Michigan chapter headed by Hamad says what the other, more subdued, ADC offices are presumably thinking. Today's e-mailed edition of "ADC Michigan News and Views," announces a community celebration on Feb. 5 "to celebrate the recent historical prisoner exchange between Hizbollah and the Israeli Government." (For my own views on this swap, decidedly less celebratory, see "Hezbollah's Victory, Israel's Decline.") This announcement is noteworthy because it refers to the traded Hezbollah terrorists and other assorted criminals as "heroes." Right: they are members of a group deemed a "Foreign Terrorist Organization" by the U.S. government and proscribed by U.S. law – but ADC calls them "heroes." I guess it's clear on which side Hamad and the ADC stands in the war on terror. April 11, 2004 update: Back to Hamad's demand that public institutions close in commemoration of the Islamic holidays (i.e., where this entry began back in November 2003): today's Detroit News reports that Hamad believes closing government offices on Eid al-Fitr and Eid ul-Adha would "send a good message showing the unity that we like to sustain, and preserve, and advance in the city of Dearborn, the state of Michigan and in the country." To which City Councilman Thomas Tafelski replied: "The city of Dearborn will follow the state and federal holiday calendar, and until that changes, that's where I stand." Rana Abbas, formerly deputy director of ADC's Michigan office. May 31, 2013 update: Rana Abbas, 33, worked for Hamad in 2000-08, rising to become his deputy director; Rashida Tlaib, 36, worked for him for five months in 1999. Both have now gone public, accusing Hamad of sexually harassing them on an almost daily basis. Tlaib (now a state representative) wrote an open letter to Safa Rifka, ADC's national chair, with copies to the U.S. Attorney and the U.S. Equal Employment Opportunity Commission. In it, she wrote that "Imad's sexual advances were aggressive. He made references to my breasts, played with my hair when I was on the phone, and made sexual comments throughout the day." In all, the two say, Hamad, who hires mostly women to work in his office, harassed at least 15 of them. Tlaib and Abbas say Hamad's harassment consisted of aggressive groping, stroking of hair, rubbing his body against women, trying to kiss them, commenting in suggestive ways on women's body parts, paddling women, pushing women against walls, and pressuring women to sleep with him. … "It's beyond what you could even imagine," Abbas said. "There were attempts to kiss my on the mouth, push me against the wall, and try to grab my face," Abbas said. "It was horrible. I would go home every day and cry." Rashida Tlaib, a former ADC employee and now state representative in Michigan. Hamad would constantly pressure her to sleep with him. When she refused, he retaliated. One time, Hamad said he would only let her go on a business trip if she would sleep with him. When she said no, he didn't let her go on the trip. Abbas is dismayed that Hamad's superiors at ADC ignored this problem: "I could not wrap my mind over how a civil-rights organization that was charged with defending and protecting the rights of individuals would not protect the rights of the people who worked for it." June 1, 2013 update: Arab-Americans and others have responded to the harassment allegations by calling on Hamad at least to step aside if not resign his position. 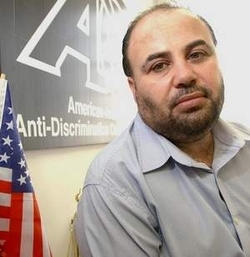 Imad Hamad, who spent 17 years with the biggest Arab-American civil rights group in the U.S., will no longer be with the organization that made him nationally known. A release issued from the national office of the ADC said, "Imad Hamad ... is no longer with ADC as of today. We acknowledge his many years of service." He survived an initial sexual harassment investigation in 2007 and was later named senior national adviser. Hamad was eventually accused of harassing or attacking at least 15 women during his tenure, according to women who said they were targeted by him. 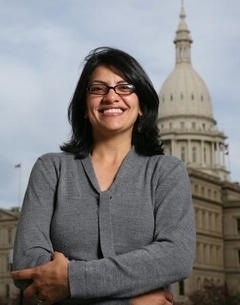 State Rep. Rashida Tlaib, D-Detroit, who was among the women who said Hamad harassed her, joined with other Arab Americans in a protest Sunday outside a concert organized by the ADC in Washington, D.C. "I'm relieved that Imad won't be in a position where he might hurt more women," Tlaib told the Free Press today. "However, it should not have taken this long for ADC to push him out." A petition drive was launched recently calling for Hamad to resign and for changes to the ADC's leadership. It has been signed by almost 600 Arab Americans across the U.S., including former members and leaders with the organization. The petition and other efforts came after the ADC kept Hamad on staff, despite a second investigation in recent months to examine the allegations against him. ADC leaders said in September there was "insufficient evidence" to prove Hamad harassed women based on the report of an attorney they hired, Teri Gorman of Southfield. But Gorman told the Free Press she never concluded that and was just assigned to gather the facts. Last month, four women who worked in the national office of the ADC stopped working in protest and resigned the first week of November. They were protesting how the ADC dealt with the matter and the firing of its national communications director, Raed Jarrar. Jarrar said today that he filed a complaint this week with the National Labor Relations Board over his firing, which he says was because he raised questions about the handling of the Hamad case. The issue of ADC's leadership also came up this week in connection with the ADC's Michigan banquet, scheduled for Dec. 13 in Dearborn. Amy Goodman, a noted radio host with Democracy Now, a liberal news program, was set to keynote the dinner, Democracy Now's website said Thursday. But after complaints from Arab Americans upset over the ADC's handling of sexual harassment, the website no longer says she will speak. Comment: Will Hamad retire quietly or find new ways to spread his venom?